Please add information about your tournaments, trial competitions and open training sessions. The Events Calendar works best if all Sports Clubs publish their planned tournament dates at the earliest possible stage and if all clubs check the calendar before planning a tournament date. Please read our guidelines, before adding your event to our website. 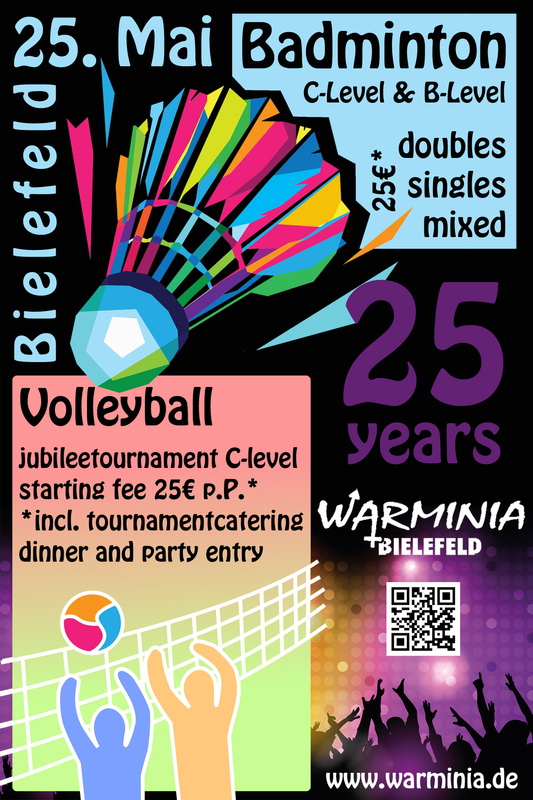 25 years of gay and lesbian sport in our lovely city Bielefeld are a fantastic reason to celebrate! After the tournament we all will meet at 7pm at Metropol dancing club (address Meisenstr. 59) where will hold our tournament dinner with jubilee-ball with ballroom dancing and latin rhythm and beats. At 10pm there will start our colourful gay and lesbian party. To avoid aching we will shake the lactate out of our arms and legs with dancing in lovely atmosphere, meeting new people and old friends and celebrating our clubs anniversary. The tournament package contains participation for the volleyball or badminton tournament, inclusive competition catering, dinner, party entry und hosted housing. The entry fee 25€** per person. It is possible to register a complete team or to pay for several other persons and you can book additional tickets for dinner or party for persons who join you. Asking for private accommodation for your companion is also possible. The package dinner & ball contains entry to our anniversary event from 19:00 with buffet and ballroom dancing and party from 22:00 (exclusive drinks). This package costs 20€** per person. With selection party you can put you on the guest list for our jubilee party for 5€ to get entry for free. hosted housing you choose, if you need a private accommodation and your team captain or team mate has registered you already. This service we can not guarantee, since private beds are limited available. Who registers first will get a accommodation for free first. *To guarantee many games and a lot of fun, we have to announce, that depending on the number of registrations several competitions may be hold combined. The medal ceremony will be held then according to the registered level. The Paris International Tournament (TIP) was created in 2004. It's a multisport tournament open to everyone and promoting the practice of sport without any kind of discriminations. The TIP federates several tournaments, demonstrations and events organized in Paris by a team of volunteers from the Gay and Lesbian Sports Federation (FSGL) and its member associations and clubs. Every year the TIP gathers more than 2,300 athletes from all around the world, taking part in about 30 disciplines in a spirit of tolerance and friendship. On competition and around, this tournament participates in the struggle against discriminations (sexual orientation, gender identity, age, origins, religion, body type, handicap...) but also against homophobia in sport. After a break in 2018 to organize the Gay Games event in Paris, the TIP will be back from 7th to 10th June 2019.